D. Peter MacLeod. Backs to the Wall: The Battle of Sainte-Foy and the Conquest of Canada. Vancouver: Douglas and McIntyre, 2016. Pp. 253. The first thing that strikes you in picking up Dr. Peter MacLeod’s Backs to the Wall: The Battle of Sainte-Foy and the Conquest of Canada is its thin size and short—often very short—chapters. At a time when bookstore shelves heave under the weight of many great military history tomes, the look of MacLeod’s skinny offering might suggest one is in for a disappointingly light read. But that initial inkling leaves a very false impression. The small space occupied by MacLeod’s book is inversely related to the space it fills in the Canadian military canon. That is because it helps fill a gap in many people’s understanding—mine included, certainly—of what happened at the Battle of Sainte-Foy on 28 April 1760, seven months after the much-more famous Battle of the Plains of Abraham that looms large in the literature. Indeed, the long shadow cast by the events of 13 September 1759—the topic of MacLeod’s previous book, Northern Armageddon: The Battle of the Plains of Abraham, published in 2008—tends to obscure the important military and political events that followed it. In his latest work, MacLeod shines penetrating light on those post-Plains of Abraham events and he succeeds spectacularly in so doing. MacLeod’s rapidly moving story picks up the action right after General Wolfe’s troops defeated General Montcalm’s on that fateful September day, with neither leader surviving to see what came afterwards. British troops, under Brigadier James Murray, quickly occupied Quebec City, but their navy, along with other British armies, retreated in the face of winter’s impending grip. Being encamped inside the walls—“isolated from the rest of the world” (p. 16) —Murray and his men were vulnerable to attack from a French side keen to reverse the outcome of the Plains of Abraham. Forcing the British out, before their navy and troops came back after the winter’s thaw, was the job of Maréchal de Camp François-Gaston de Lévis, senior field commander to Pierre de Rigaud de Vaudreuil, Governor General of New France and Commander-in-Chief of all French forces in North America. It was also a task that sat squarely in the broader context of an unfolding war with global dimensions. What began in 1754 with a British attack in Pennsylvania (a battle that featured a young Lieutenant Colonel George Washington) had, by 1759, exploded into conflict in Europe, Africa, the West Indies, South America and North America. It was truly the first “world” war and it did not end until 1763 with the signing of the Treaty of Paris. Re-organising and re-provisioning French troops after the loss at the Plains of Abraham, Lévis planned a spring offensive against the British inside Quebec City from his base in Montreal. Likewise, the increasingly hungry and scurvy-savaged British within those walls planned for the inevitable attack from without, hoping to hold off the French until the British navy arrived. But they had to leave Quebec City—they needed to have some forward momentum—to have any real chance of beating the French. The two sides came toward each other with memories of the Plains of Abraham in mind. Recalling that Montcalm’s troops quickly lost cohesion when facing Wolfe’s army in the late summer of 1759, Murray traded “speed for coherence” in leaving the double-edged protection of Quebec City’s walls in the early spring of 1760. He moved his troops in line in what MacLeod called a “methodical advance” towards the advancing French (p. 82). Yet in doing so, he surrendered control of the high ground of the Buttes-à-Neveu and descended into lower, swampy ground. As MacLeod writes: “Under these conditions, any forward movement represented an achievement. To do so while holding formation in a line a thousand metres long, composed of infantry and artillery moving at different speeds, was altogether remarkable and unavoidably slow” (p. 82). Lévis took the opposite approach, accepting “vulnerability in exchange for speed” by marching in columns. However, the French had to transition from columns to lines once coming under fire from the British, costing them time and blood. But all was not lost for Lévis. While his French regulars formed up under fire, the Canadian militia “could take cover and fire immediately,” inflicting many British casualties (p. 84). The battle itself on that cold April day was a bloody affair that killed a total of 518 and wounded more than 1,500 on both sides, with Lévis seizing the day. Thus, from a battle-tally perspective, it was one each: the British won on the Plains of Abraham, and the French won in Sainte-Foy. Yet that was only part of the story. Within less than a month, the British navy arrived with vital provisions of men and materiel. That they showed up first, before the French ships, quickly dampened morale. On seeing the ships, Lévis knew it was over: “We have done and are doing what we can. I think that the colony is lost” (p. 134). Expertly navigating the rocks and shoals of the narrowing St. Lawrence, Murray, along with his fleet and his troops, combined fire and movement in chasing Lévis back to Montreal where Lévis eventually surrendered. Murray lost the battle but won the war. He stayed on as Governor of Quebec until 1768. MacLeod introduces readers to many fascinating characters as he races us across these landscapes of battle. For instance, the reaction of the nuns of Quebec’s Hôpital Général to the influx of wounded from both sides following the battle starkly evoked the horrors of war: “We saw nothing but amputated arms and legs” (p. 114). MacLeod’s extensive use of first-hand accounts here and elsewhere adds colour to a narrative that moves with pace and purpose. He lets the quotes do much of the talking, keeping his own analysis relevant and crisp. The result is captivating. You can almost feel the cold grip of the 1759/60 winter in reading his book, and you get a sense of the sheer terror that locals experienced as the two armies tore into each other, yet again, in and around their homes and farms. MacLeod also weaves in the vital contributions of local Indigenous nations, such as the warriors of the Seven Nations “and the nations of Acadia.” As he recounts, these warriors—who “found themselves in a military environment even more alien than a European battlefield”—carved out a valuable role for themselves “that combined their particular military skills and practices with the necessities of siege warfare” (p. 126). As much as MacLeod succeeds in situating readers amid the fluid and multi-nation events of the day, however, any connection to place would be somewhat lost on readers who have not been to Quebec City and its environs as there are no maps in this book (there are a few images from paintings, but the effect is not the same as that of a good map). MacLeod says the Sainte-Foy battle happened “just to the west of the 1759 battlefield” but a battle map would have been a useful addition. As well, MacLeod’s quick-tempo writing can occasionally do a disservice to some key points he is trying to make. He contends that Lévis’s charge against Murray’s troops “should be as well known as Montcalm’s charge across the Plains of Abraham in 1759, Issac Brock’s charge at Queenston Heights in 1812, and the Canadian advance on Vimy Ridge during the Battle of Arras in 1917” (p. 102). This is a bold contention given the territory that these other charges occupy in Canadian military history. But the Lévis charge, like all other events in MacLeod’s sprint-like storytelling, is over in a flash. I would have liked to read more about the strategy and tactics that Lévis employed in the face of a British leader taking a “whatever it takes” approach to beating the French (and to suppressing the local population). But this speaks to one of the triumphs of MacLeod’s book—it gives you just enough, and piques your curiosity just enough, to stimulate interest in researching other aspects of this fascinating battle and its ramifications. 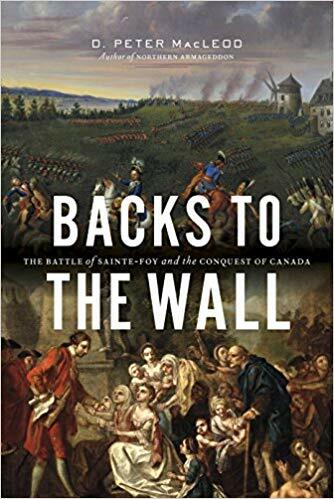 Backs to the Wall is a welcome addition to any bookshelf, with general and academic readers alike rewarded by an incisively told story supplemented by a robust bibliography of primary and secondary sources. Thanks to Peter MacLeod, the Battle of Sainte-Foy is no longer in the shade. Originally published in 1959, Quebec, 1759: The Siege and the Battle (Macmillan) by famous Canadian military historian Colonel C.P. Stacey is perhaps the definitive English-language book on the Battle of the Plains of Abraham. Similarly, The Canadian Frontier, 1534-1760 (University of New Mexico Press, 1983) by W.J. Eccles puts this battle into its historic context. Montcalm et Lévis by Henri-Raymond Casgrain, written in 1898 (Mame) and translated into English in 1964 (University of Toronto Press), discusses the battle from a French perspective.